If you were a Facebook friend of HerSavings.com in the past, please make sure you ‘Like’ the HerSavings new facebook page. 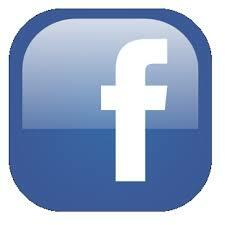 Unfortunately, I had to start a new facebook page and for that reason, all our Facebook friends were lost. You can click here to access our new page, and we really hope you do! We will be having a lot of fun on Facebook, so if you have not already, I highly suggest you give our facebook page a ‘Like’ so that you will always be the first to know when new offers are posted on the HerSavings.com website and not miss out on the fabulous giveaways that we like to have! Do you want to win a $25 Amazon e-card?! Each month, I will host a giveaway where a HerSavings Newsletter subscriber will win a $25 Amazon e-card! To be eligible for this prize, all you have to do is sign up to be a newsletter subscriber and you will automatically be entered to win (if you are already a subscriber, you will automatically be entered into the monthly drawing). You will be notified via email if you are the winner. Even better, you can sign up to be a fan on our facebook page for an additional contest entry! But you must be signed up for our newsletter to be eligible to win! **Each winner will be randomly chosen. It’s time to announce the winners of the Farmer’s Garden by Vlasic Product Giveaway! Thanks to everyone who entered our giveaway! We have a new giveaway planned that I will be posting in just a few days so stay tuned! Congratulations to all of our winners, please contact me with your mailing information within 48 hours to claim your prize!! I have been so excited to announce this giveaway!! The absolutely amazing people at Vlasic want to give 5 lucky HerSavings readers a Free Farmer’s Garden by Vlasic Product Coupon!! First off, let me start by saying that my family loves pickles! My 7 year old son Kevin, can eat a whole jar of pickles in one day, if I let him! I use pickles in recipes including potato salad, egg salad, deviled eggs, on sandwiches/hamburgers, on the side, as a snack, but my favorite is fried pickle spears! I only use Vlasic Pickles for my fried pickle spears, the taste of Vlasic pickles and the amount of seasoning make them perfect for this recipe. My last batch of fried pickle spears, I used Farmer’s Garden Kosher by Vlasic, and let me tell you, this was the best batch ever! I will post my recipe early next week! What makes Farmer’s Garden Pickles by Vlasic so yummy? Farmer’s Garden by Vlasic are made with the finest U.S.-grown cucumbers harvested at the peak of freshness, married with specially selected ingredients and hand-packed within days to bring you the perfect premium pickle. Delivered from the farm to the pickle aisle at your local store, Farmer’s Garden by Vlasic artisanal-quality pickles is for anyone who enjoys honest ingredients and bold fresh taste. If you have not tried Farmer’s Garden Pickles, rest assured this is a product worth trying! 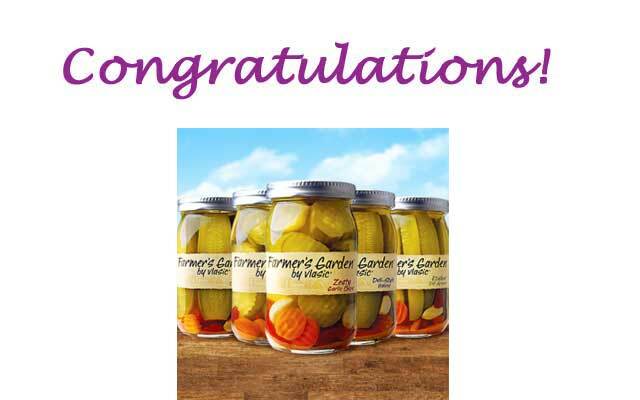 More than 50,000 consumers voted Farmer’s Garden by Vlasic, the 2013 Product of the Year in the vegetable category! I don’t know about you all, but talking about these yummy pickles are making my mouth water!! 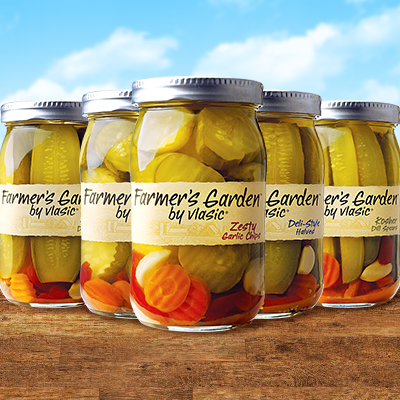 Farmer’s Garden by Vlasic is celebrating summer with a multi-city traveling pickle stand tour and would like to give 5 lucky HerSavings readers a Free Farmer’s Garden by Vlasic Product Coupon! You must be a fan of HerSavings.com on Facebook, if your not already a fan, you can click here to sign up. *Please note that facebook ‘likes’ will be verified. ‘LIKE’ Vlasic Pickles on Facebook. Make a comment on this post telling us what you like best about Vlasic Pickles, your favorite variety, or perhaps a favorite recipe that includes Vlasic Pickles. *Please DO NOT post your entry comments on facebook! Click HEREto make your comment. Just scroll down all the way to the bottom where it says ‘Leave A Reply’. This giveaway will end August 2nd, at 11:59PM ET. The 5 winners will be randomly selected and announced later in the week. 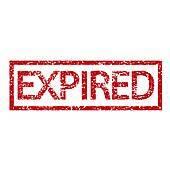 *Please note that an email to me is not an acceptable entry and will not be counted. You must be a resident of the US. Vlasic Pickles will send each winner a coupon by mail for a Free Farmer’s Garden by Vlasic Product! It’s as simple as that!! Good Luck!! 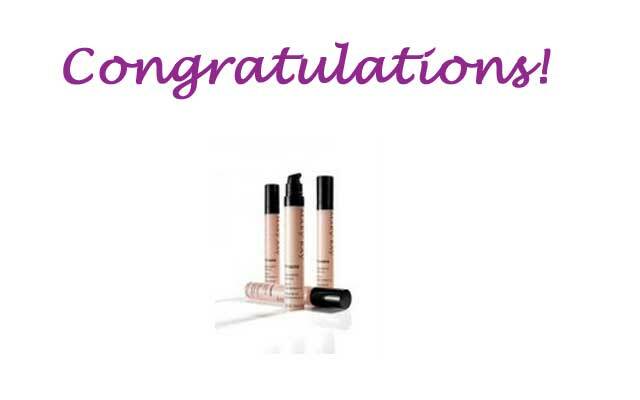 It’s time to announce the winners of the Mary Kay TimeWise Replenishing Serum+C vials giveaway! *Each winner was chosen randomly using rafflecopter. It’s A Contest!! Win 1 of 4 Mary Kay TimeWise Replenishing Serum+C Vials!! WOOHOO! I have another contest to tell you all about! Holly Miller, who has been an Independent Mary Kay Beauty Consultant for over a year is sponsoring another giveaway for HerSavings.com Readers!! Thank you Holly!! Mary Kay prides themselves on having high quality products, and one of my favorites, and Holly’s as well, is the TimeWise Replenishing Serum+C. With TimeWise Replenishing Serum+C, skin appears lifted and firmed. This antioxidant-rich serum is formulated with ingredients that enhance the production of new collagen and help keep existing collagen from breaking down. It also contains ingredients known to support elastin. The formula is enriched with a potent blend of multiple botanical sources, known for their high levels of vitamin C.
HerSavings has teamed up with Holly to giveaway 4 vials of the TimeWise Replenishing Serum+C, a $55.00 value! Four lucky HerSavings.com readers will win one of these awesome TimeWise Replenishing Serum+C vials, so that you can see how amazing this stuff really works! Just follow the steps below to enter (click where it says ‘Read the rest of this entry‘)! Good Luck! YAY!! It’s time to announce the winners of our Jolly Holidays Box Full Of Goodies Giveaway!! This contest has ended! Thanks to everyone who entered! HerSavings has teamed up with Holly Miller (who just recently sponsored our Mary Kay Brush Giveaway, and our October 2011 Trick Or Treat Masters Box Giveaway!) to do another giveaway for HerSavings.com readers!! 6 VERY lucky HerSavings readers will win 1 of 6 Jolly Holidays Masters Boxes!! The boxes are filled with great items such as candles, tarts, bath & body products, makeup, scrubs, cookies, jewelry, party favors, cards and so much more!! You guys are going to love this!! I love surprises and these boxes from My Dream Sample Box are just that. There are so many surprises included that I am not going to even try to pick out a favorite!! Most of the items included in Jolly Holiday’s Masters Box include samples and information from home based businesses which means that a lot of the items you are receiving are handcrafted! These boxes would make such a great gift to send to friends or even to spoil yourself with. For me, like I said, I love surprises and trying new items so this is the perfect way for me to do just that. 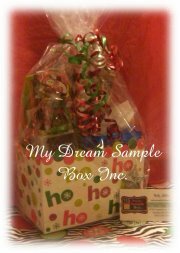 My Dream Sample Box offers samples from the best crafters, artisans, and small businesses on the Internet. These companies are dedicated to making sure you see the best that they have to offer! Each month My Dream Sample Box themes their sample boxes which are filled with different businesses’ products for you to view. The boxes are filled with great items such as candles, tarts, bath & body products, makeup, scrubs, cookies, jewelry, party favors, cards and so much more! They also have their monthly “Masters” Direct Sales Box! 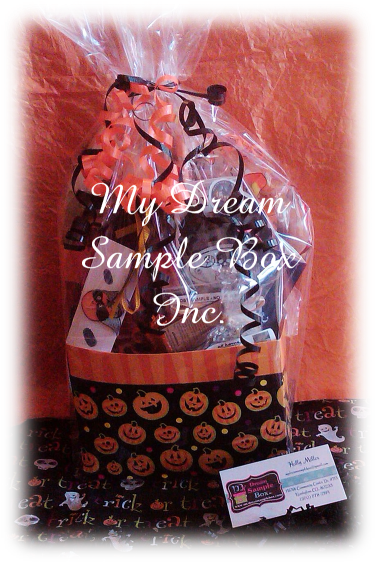 This box includes samples and information from home based businesses for you to try & enjoy! As I mentioned above, I have teamed up with the amazingly wonderful Holly Miller, who is the owner of My Dream Sample Box, to giveaway 6 Jolly Holidays Masters Boxes!! Six very lucky HerSavings readers will win a Jolly Holidays Masters Box each! YAY!! Each box will contain 10-30 samples from Independent Representatives of Direct Sales Companies. Each box is a $20.50 Value!! You must be a HerSavings.com Newsletter Subscriber, if your not already, you can sign up here. And remember, by being a HerSavings newsletter subscriber, you are automatically entered into our monthly giveaway where 2 winners each win a $25.00 Amazon E-Gift Card!! 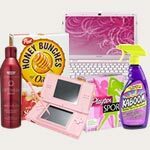 You must be a fan of HerSavings.com on Facebook, if your not already a fan, you can click here to sign up. ‘LIKE’ My Dream Sample Box on facebook. *Please note that facebook ‘likes’ will be verified. Make a comment on this post telling me which Theme Box you would like to try most from My Dream Sample Box. *Please DO NOT post your entry comments on facebook! Click HERE to make your comment. Just scroll down all the way to the bottom where it says ‘Leave A Reply’. This giveaway will end January 2nd, at 11:59PM ET. Six winners will be randomly selected and announced later in the week. *Please note that an email to me is not an acceptable entry and will not be counted. You must be a resident of the US. Huge Thanks to Holly Miller, My Dream Sample Box! YAY!! It’s time to announce the winners of our Trick Or Treat Masters Box Full Of Goodies Giveaway!! 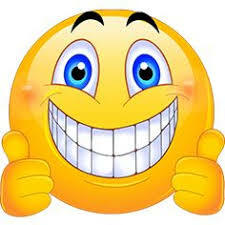 Congratulations Jamie & Jennifer, please contact me with your mailing information within 48 hours to claim your prize!! You both are really going to enjoy your prize! !